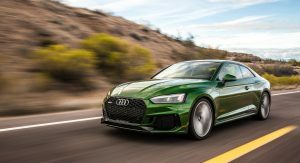 The 2018 Audi RS5 coupe has finally gone on sale in the United States. 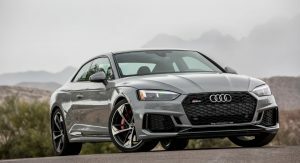 Priced from $69,900, the RS5 features an aggressive exterior with larger air intakes and a unique Singleframe grille. The model has also been equipped with oval exhaust tips, a rear spoiler and a RS-specific diffuser. 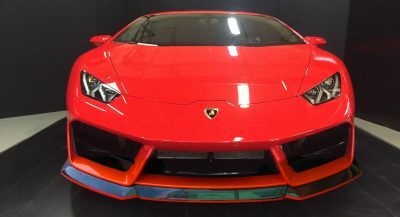 Rounding out the highlights are LED lighting units, a power sunroof, matte alu-optic accents and 19-inch forged wheels with summer performance tires. 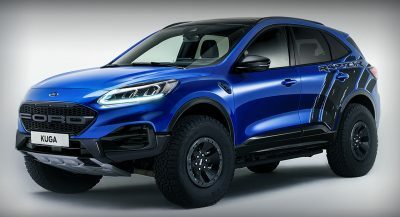 Customers can also order 20-inch wheels and a Black Optic package which includes body-color mirrors, gloss black exterior accents and 20-inch wheels with a two-tone finish. The interior comes nicely equipped with a flat-bottomed sport steering wheel, stainless steel pedals and 12-way power front sport seats which are covered in leather and Alcantara upholstery. 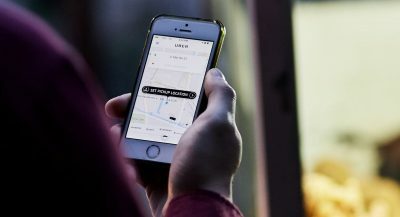 Drivers will also find illuminated door door sill plates, a tri-zone automatic climate control system and heating and massage functions for the front seats. 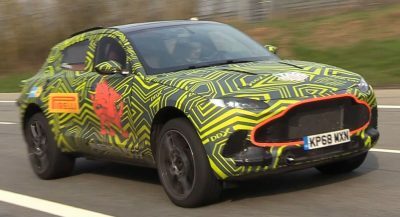 An assortment of different options will be available including a 12.3-inch Audi virtual cockpit, a 19 speaker Bang & Olufsen audio system and a color head-up display. Buyers can also order an MMI navigation plus infotainment system. The standard model comes with a handful of driver assistance systems including side assist, rear cross traffic assist and a pre sense city system which can automatically brake the vehicle if a potential collision is detected. Customers can also order active lane assist, high beam assist, traffic sign recognition and an adaptive cruise control system with traffic jam assist. Power is provided by a twin-turbo 2.9-liter TFSI V6 engine that produces 444 hp (331 kW) and 443 lb-ft (600 Nm) of torque. 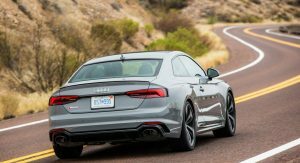 It is connected to an eight-speed automatic transmission and a rear biased quattro all-wheel drive system. This setup enables the RS5 coupe to accelerate from 0-60 mph in 3.7 seconds before hitting a top speed of up to 174 mph (280 km/h). 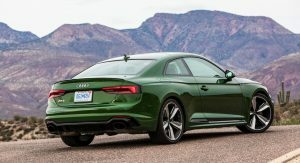 Since the RS5 is all about performance, the car has a unique sports suspension which lowers the ride height by 7mm (0.27 inches) compared to the S5 coupe. 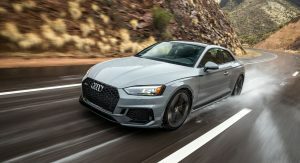 Engineers also installed cross-drilled brake discs and an Audi drive select system which has four setting – comfort, auto, dynamic and individual – which adjust the quattro sport differential as well as the gear shift points, steering and throttle response. 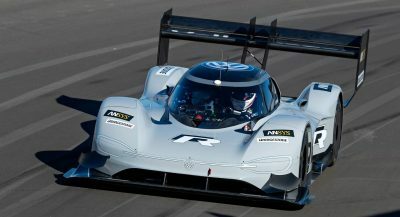 If that isn’t impressive enough, the car can be equipped with a dynamic steering system, carbon-ceramic brakes and an RS sport suspension plus with dynamic ride control. The latter option adds adjustable dampers which promise to improve the model’s driving dynamics. How nice. 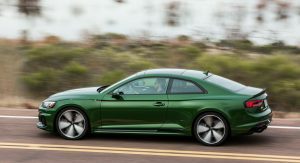 In my country RS5’s price start 144 883 €, thanks to our lovely automobile tax. What does that equate to in American dollars? And what country? Are you from Denmark? Or Norway, and maybe Finland? Only pity about Finland, is the tax, specially over the cars. Yeah, there is a reason why in Finland there is still a biggest and oldest fleet of cars. Thanks to taxes. 144 grand for a compact coupe. You guys are getting ripped off. When does the cabriolet come out? And the RS4 Avant to the US ? It costs 100 000 $ in eu! Without extra taxes! In Italy starts at 89.900€ = 110.000 US $ tax incl. 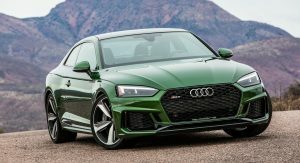 Not sure if this green or the British racing green is better.. but this is one amazing Audi. what a looker. …and no avant version for the good ol’ US of A- epic FAIL dear audi. Yeah I know. Everything is fu***d up in Finland what comes about prices.